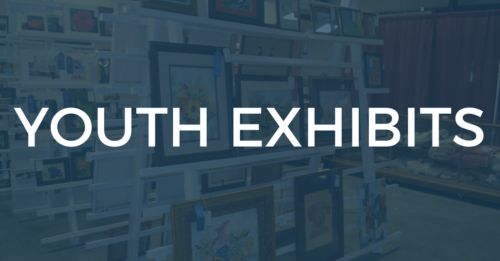 Entries for the Youth Exhibits at the Smith County Fair will be taken between 8:00 a.m. and 12:00 p.m. on Saturday, June 30, 2018. Entries will be taken on Monday, July 2, 2018 between 8:00 am and 12:00 for Cooking only. Entries will be taken between 8:00 a.m. and 12:00 p.m. on Saturday, June 30, 2018, with the exception of Cooking. Entries for Cooking will be taken on Monday, July 2, 2018. The division entered will be determined by the youth’s grade as of January 2018. Name, address, and phone number must be on the bottom or back of each item. No person may enter more than one entry in any one lot. All items must have been made within the last year. Prizes will be awarded on the decision of the judge(s). Judge(s) will not be required to award prizes unless the quality of the entry is deserving of recognition. Premiums will be paid and exhibits must be removed between 1 and 3 p.m. on Sunday, July 8, 2018. 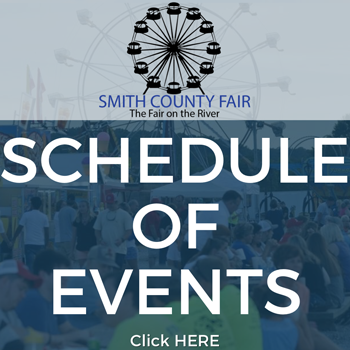 The Smith County Fair will not be responsible for any entry left past the time specified in rule number. Competition open to Smith County youth grades K-12 and Smith County 4-H members. 1. Youth must sew items by machine or hand. All articles must be hand painted by exhibitor. Entry must be matted or framed. Judging will be based on quality of art exhibited. Entry must be taken by the youth exhibitor. All photos mus by 5″x7″ or smaller. Only 1 entry per Lot. Entires must be labeled with product name, date of preparation, and name of exhibitor on bottom of jar. Canned items will not accepted unless they are sealed Ball, Kerr, or Mason canning jars — 2 piece seal. One piece seal not accepted. Quarts or pints will be accepted. Product must be canned since last year’s fair. Entry must be made by the youth exhibitor. No purchased mixes may be used. All entries must be made from scratch. No entries will be returned. Only ribbons and premiums will be provided to winners. Entries that do not place may or may not be displayed depending on availability of space. Entries must be in disposable containers or ziplock bags. A copy of the recipe must accompany each entry. Must be submitted, correctly labeled with category. Arrangements must be made by youth exhibitor. Vases will NOT be provided for entries. Place in small vases. Not responsible for personal vases left. Lot 13 Green Plant, Vine, Fern, etc. Lot 29 Green Plant, Vine, Fern, etc. Lot 43 Green Plant, Vine, Fern, etc. Poster must have been made by 4-H member within the last year. Grade as of January 2018 will be used. Poster must be drawn horizontally. Must have been a 4-H member during the 2017-2018 school year. Exhibit must be related to one of the twenty-six 4-H project areas (not a school or science project). Exhibits must be registered and set up on Saturday, June 30, 2018 between 8 a.m. and 12 p.m. Contact the 4-H Office at (615) 735-2900 for more information.